Belfast republican and former prisoner Martin Neeson served over eleven years of a life sentence and was released in 1987. Last week he was before Belfast’s High Court and won a judicial review into the decision by the Civil Service to sack him from his job as a landscape gardener with conservation volunteers in west Belfast - a job he had held for 18 years. The court heard that Mr Neeson was an exemplary employee with a blemish-free record. Yet he was summarily dismissed from his post, without appeal, on the grounds that his conviction and time in prison deemed him ‘unsuitable’. Why Martin Neeson was ‘unsuitable’ as a landscape gardener was not explained and the Civil Service failed to formally adopt the guidelines agreed between the Office of the First and Deputy First Minister, ‘Guidance to Employers’, which stipulates that prospective employers should disregard political convictions when recruiting staff. Sinn Fein MLA and junior minster Jennifer McCann, a former republican prisoner herself, and Coiste na n-Iarchimi, a republican ex-prisoner group, intervened on Martin Neeson’s behalf. Ms McCann spoke with ministers Simon Hamilton and Arlene Foster, who has the power to overturn the sacking decision but minister Foster refused - presumably on the grounds that she supports it. The sacking of Martin Neeson follows previous discriminatory action in employing former republican prisoners. In 2013 the TUV’s Jim Allister secured the support of other unionists and, disgracefully, the SDLP, in introducing the SPAD Bill into the assembly which bans former prisoners, who served more than five years, from being special advisers to ministers - even though the minister in question may well have been a former prisoner like Martin McGuinness, Caral Ni Chuilin, Gerry Kelly or Jennifer McCann. The grounds for this discriminatory action had previously been set when two former prisoners were refused employment by the Simon Community - an organisation dedicated to help disadvantaged people (unless you are a former prisoner, that is). The case became known as McConkey/Marks after the former prisoners. The Simon Community were bolstered in their employment ban by the Fair Employment Tribunal, the refusal of a judicial review and a ruling by five judges in Britain’s Supreme Court. The court’s ruling relied on the ironically named ‘Fair Employment Treatment Order’ 1998 (FETO) which legally approves discrimination against former prisoners. It states that a convicted person with a political opinion who supported armed struggle can be lawfully discriminated against even though in the McConkey/Marks case both stated they supported the peace process. In effect FETO is a VETO. It means that former prisoners can be legally discriminated against. A former prisoner can be a minister in the north’s government; sit on the Policing Board which employs and recruits the police; be elected to the legislative assembly but is banned from gardening and helping the less well off. How absurd is that? Coiste na n-Iarchimi are currently preparing a submission to the United Nations seeking their intervention to remedy these discriminatory practices against all former prisoners, republican and loyalist. The title of the submission, ‘Equal Citizenship for Ex-Political Prisoners’ details the scale of the demonisation of the ex-prisoner community, numbering tens of thousands of people when their families are taken in to account. 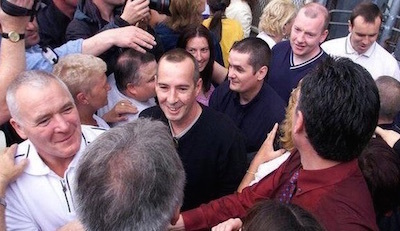 Legal discrimination against former prisoners means they can be denied employment where it requires Gardai or PSNI approval; in the public sector, in schools and universities, in policing and the judicial system, in the caring services, in the financial services as taxi drivers, in youth, community and social work in nursing, medicine and teaching. They can be denied insurance to cover their home, car, business and mortgage. Their pension can be affected due to the years spent behind bars. They are routinely excluded from the US, Canada, New Zealand and Australia. They have been denied the opportunity to adopt or foster children. And those still out on licence can be, and have been, returned to prison on the basis of secret intelligence, they know nothing about. Former prisoners helped create and sustain the peace process. They are entitled to benefit from it. They should be legally recognised as full and equal members of society like everyone else.